CynDetails will be on a short break. Please message me or email to check with me if I can squeeze in a specific request that you have for your event or home decor needs. I am in the process of merging new handmade products to the shop. Please follow my Instagram for updates on the re-opening of CynDetails. You can also DM me on Instagram as well. All previously placed Cake Topper orders are being fulfilled as scheduled (please check your tracking info for more details). So cute! We used it for our puppy’s 1st Birthday! Amazing work!! Thank you for the beautiful cake topper!! Awesome service. What an honor to see my favorite bakery repost and feature my cake topper and Bundtini display on their Instagram page!!! They've been my go-to bakery ever since 2006, and I still love them to this day! Thank you, Nothing Bundt Cakes!!!! My goal is to bring that "wow factor" to your celebrations with my handmade cake toppers! Welcome to CynDetails! Thank you for visiting my shop! If you don't find what you're looking for, feel free to ask me. You can also view more photos on my Instagram page @cyndetails . I look forward to creating something unique for your event! How long is shipping time for U.S. Residents? CynDetails ships orders via USPS First Class and the estimated delivery time for U.S. Residents is usually 2-5 days. All orders are shipped from California. After you purchase an item, you will receive a tracking number and delivery confirmation via email. If you ordered from my shop on a Saturday or Sunday, your package will be shipped the following Monday or Tuesday (if Monday falls on a National Federal Holiday and all Post Offices are closed). Please note that CynDetails is NOT responsible for packages that are lost or delayed due to USPS Postal error. What is the turn-around time for orders? 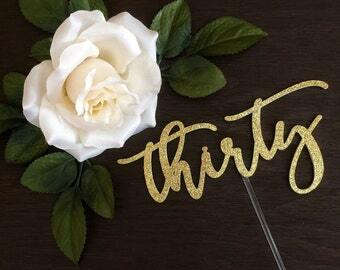 All cake toppers are made to order and ready to ship within 3 to 5 business days - depending on the week's workload and also the queue that your order has been placed in. I will not let your order be processed past the fifth business day within ordering. What if my package was sent to the wrong address because I moved? When checking out an item, the buyer must double check and confirm that the address entered in the "shipping" section is the current and correct address. Customers will assume financial responsibility in case of "buyer error", i.e. wrong address. If CynDetails is not contacted with the change of address, the package will be delivered to whatever address is populated in the shipping section of the checkout form. How do you handle damages upon arrival (Postal Service Transit issues)? For non-customized orders, I will refund or exchange your item as long as I am contacted immediately within the first 3 days of receiving your order (according to your Tracking information from USPS). Buyers must pay for the "return shipping" cost. I will send you a custom listing link to purchase - which is the "return shipping" cost. You will then be emailed a PDF file of the return shipping label where you can print and attach to the original packaging in which your order was received. After I receive the returned package, you will be refunded. What if I would like to request a different size other than the one that is listed in the description of the listing? I can only resize your topper up to 8 inches in width. Please note that measurements start from the first swirl/flourish to the last swirl flourish, and not the actual letters. Do you use other carriers besides USPS? CynDetails only ships via USPS First Class or USPS Priority. I do not use any other carriers for my shipments. Look for the blue button at the front of my Etsy shop page that says "Request Custom Order. Once you click that, it will open up the Etsy messaging where you can leave me a message for a custom order. If you are using your phone while looking through my shop and want to request a custom order but cannot find the blue button, just leave me a regular message and request a custom order through the messaging. Once I create your custom listing and send it to you via Etsy messaging, you have 24 hours to purchase the link. After 24 hours, I will delete the link. What if I need my order within the week? You have the option of choosing "USPS Priority 2-3 Day" shipping which includes a "RUSH" fee that covers the cost for my extra labor time to work on your order ASAP. You will find that option at the checkout and shipping section. When will my order be shipped if I ordered on the weekend? All orders made on Saturdays and Sundays will be shipped out the following Monday or Tuesday (if Monday happens to be a Holiday). Why is the pricing for your Priority/RUSH Shipping so high? I always advise customers to please give yourself enough time when ordering from my shop (at least 2 weeks). I take great care in handling every single order that comes through to my shop. When I have a request for a last minute order that is needed within a few days ASAP, it throws my daily orders production queue off schedule. Please consider the time I take to handle your order by moving it to the "front of the production line" and having it shipped the same day (or next day if ordered after 5pm). The fee also includes the Priority shipping postage.